Sheikh Mufti Ismail Musa Menk was born in Harare, Zimbabwe. He was tutored by his father who is a well known scholar and Da'ee. He is a broad minded, motivational speaker who has won the hearts of many. He teaches at the Darul Ilm in Harare and finds the time to attend many international religious conferences, seminars etc. He has been invited on lecture tours to many countries. He contributes towards the Islamic content of various media networks and is an experienced social worker and counselor. He has visited Sri Lanka to deliver series of lectures in the past few years. 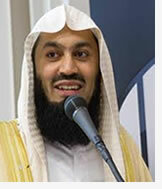 Click here to access Mufti Menk's lectures available in this site.